Ian Read, Richard Hussey and Tim Shields done a great job driving the bus in modern traffic conditions but admittedly they were not faced with shellfire, horse traffic or even frost. We have had to plan round low bridges, avoid busy roads and even occasionally lop overhanging tree branches. The magneto has been replaced following misfiring but otherwise B2737 and it’s drivers have taken it all in their stride. 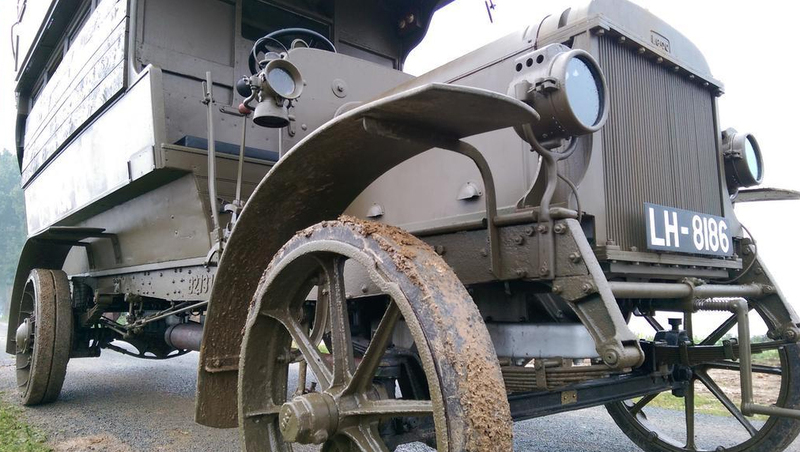 We continue to have only admiration for the B-type drivers who worked under such difficulties on the pave of Flanders and the Somme a century ago. 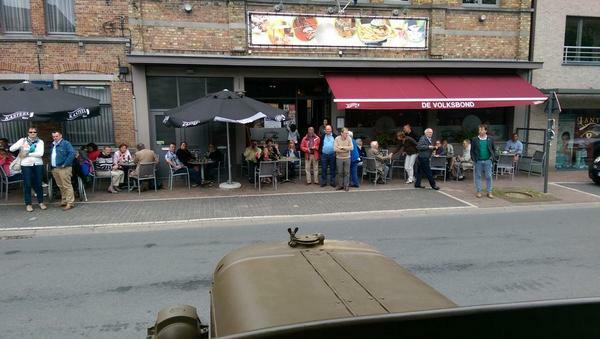 Today the Battle Bus reaches its final destination of Albert, France. One hundred years ago, German armies were spreading into Northern France. British and French troops mounted a series of counter-offensives known as the ‘Race to the Sea’ starting with the First Battle of Albert that began on 25 September. Albert was also a key location in the Battle of the Somme between July and November 1916, one of the worst battles in human history. At the end of five months of fighting British and French forces had advanced six miles into German-occupied territory and around one million lives had been lost. 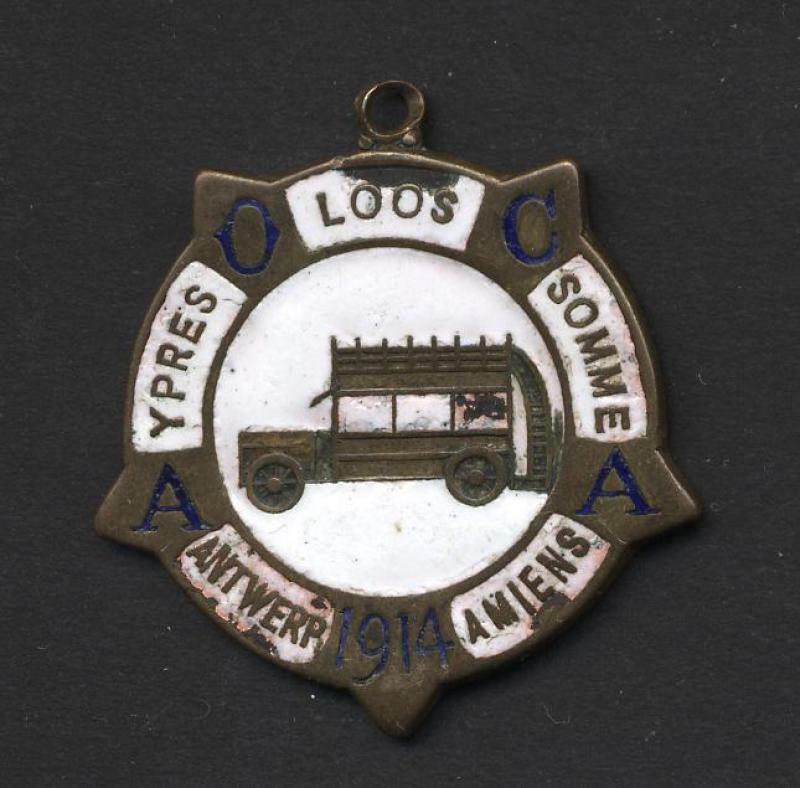 B-type buses, organised into Auxiliary Omnibus Companies as part of the Army Service Corps played their part carrying troops to the Front, and wounded men back. 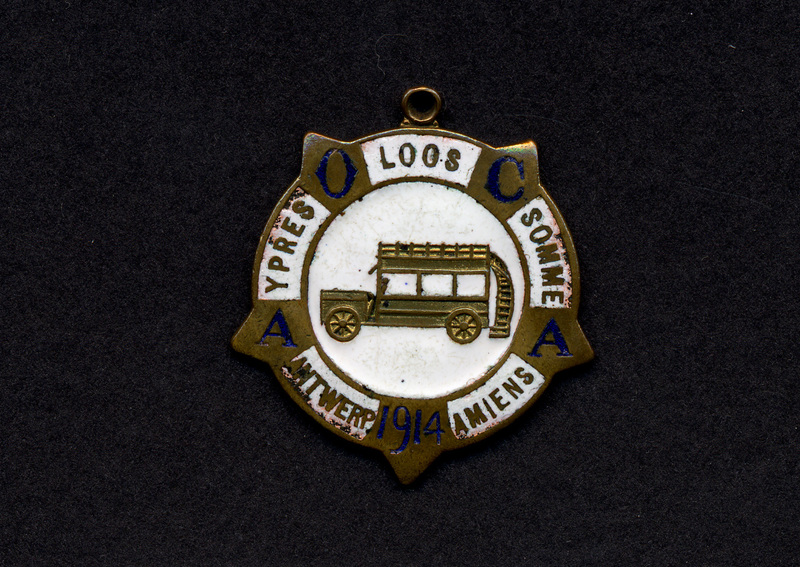 The Auxiliary Omnibus Companies’ Association, fore-runner of today’s TfL Old Comrades Association, was formed in 919 by London bus drivers who had served with the Army Service Corps during the First World War. Today the Battle Bus reaches its penultimate destination of Peronne, a small town situated on a hill side overlooking the battle fields of the Somme, where more than a million men were wounded or killed in 1916. 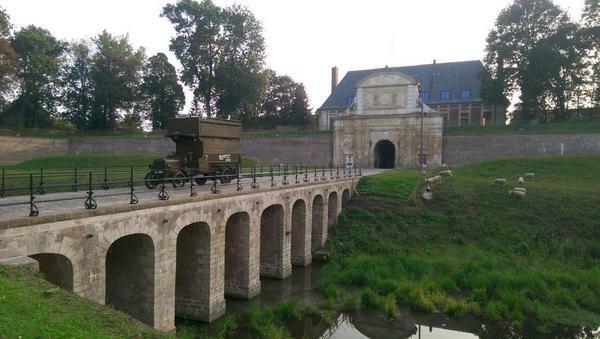 The Musee de la Grande Guerre occupies the Chateaux de Peronne in the centre of the town. It tells the story of the men and women who lived through the conflict and suffering of the First World War. The return of the Battle Bus brings one small aspect of that story back into focus, helping us to imagine what we did not see. 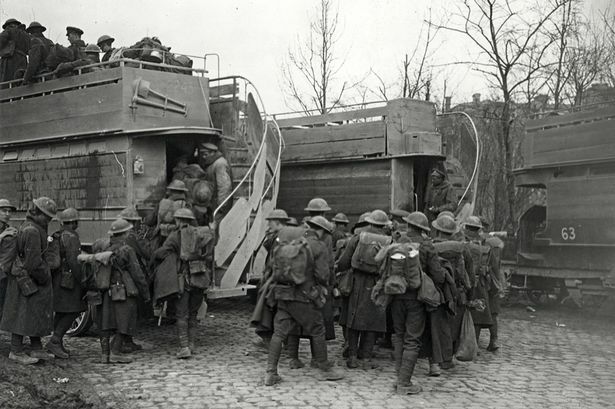 The 51st Army Service Corps bus company served at the battle of Peronne in 1918; as part of the Allied advance that halted the German offensive and moved the conflict closer to the Armistice. In 1920 the first Remembrance Service was held at the Cenotaph in Whitehall. 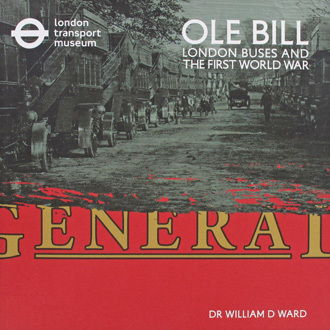 London General Omnibus employee Philip Sydney Bowden was chosen to lay a wreath on behalf of London’s transport workers. He had volunteered for the army at the age of 17, fought at the Battle of the Somme and been wounded in a gas attack. 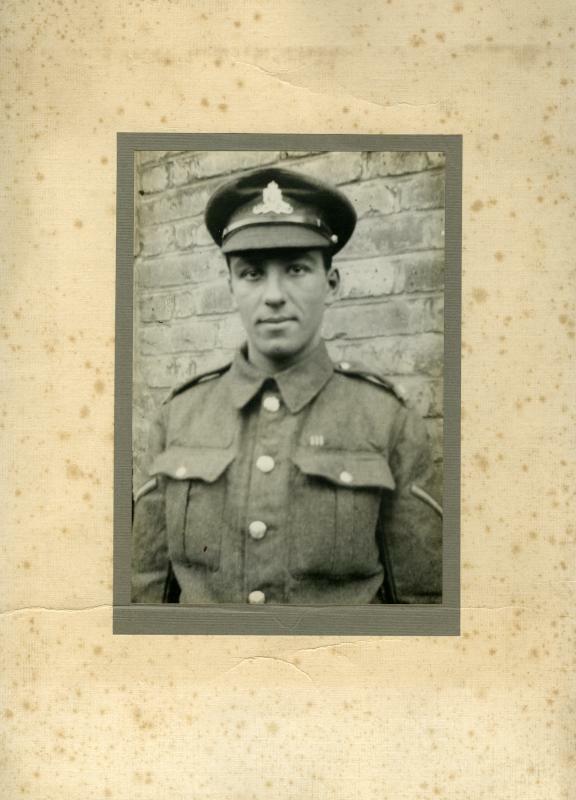 Philip Bowden was awarded the Military Medal for Bravery for carrying a wounded comrade to safety under enemy fire. His daughter Jean recalled that like many men of his generation ‘he never spoke much about the war’. 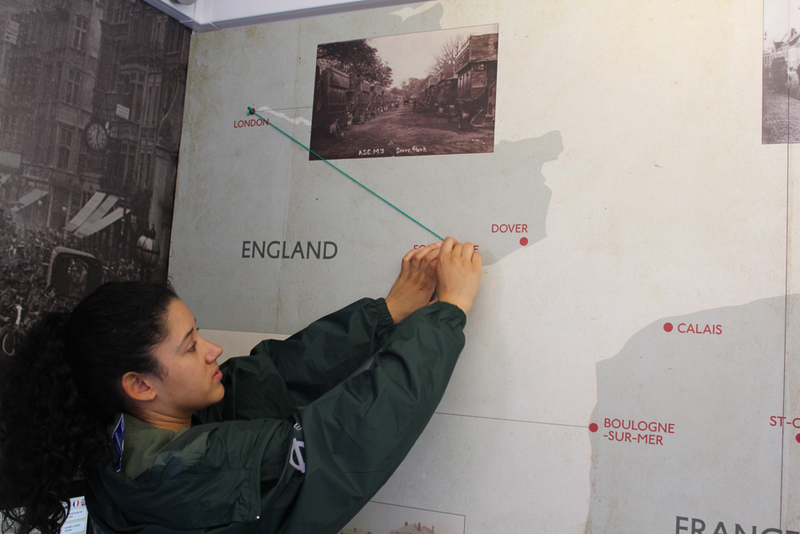 The Battle Bus Learning Programme supports audiences to understand the role that London Buses played during the First World War. Our key audiences are: Young People from areas of disadvantage, Female London Bus Staff and Primary School Children. The programme has two young people who are supported through an apprenticeship. They support the learning and participation of the Outreach Volunteers, document the restoration and support the interpretation and content development of exhibitions which will support this project. 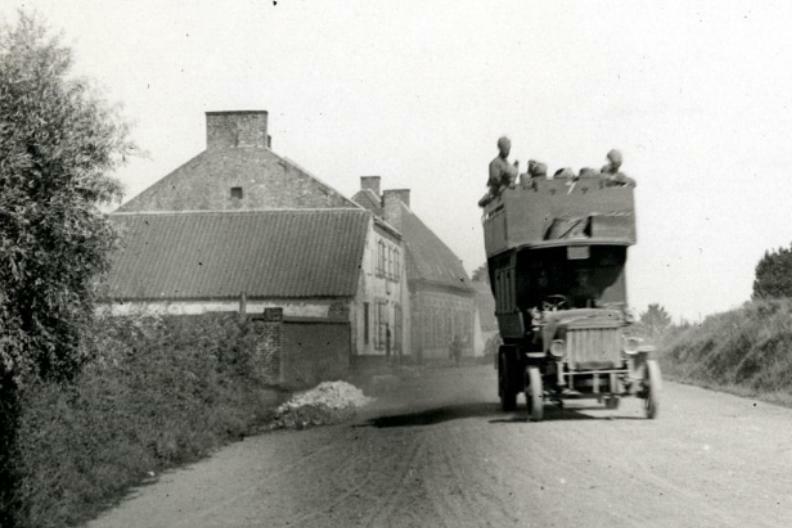 I spent much of my 24 hours on the Battle Bus tour on the road, either accompanying Battle Bus from Le Shuttle to our base in Messines or travelling between villages all along the areas where once there were army camps, casualty areas or crossroads where people and supplies arrived at or departed from the Western Front. What I was continually struck by, as I weaved through tiny roads and everyday villages was the constant reminders of battle. On each journey I passed a handful of cemeteries and saw road signs indicating a dozen more in any direction. I passed field upon field where I could still sense the hundreds of soldiers bedding in each night. It is impossible to ignore or not be affected by each area and each story it brought with it. I was very aware that while exciting and adventurous for the team and I, there are many difficult memories that could also be stirred. My journey began in Folkestone where we were visited by local schools and shoppers. 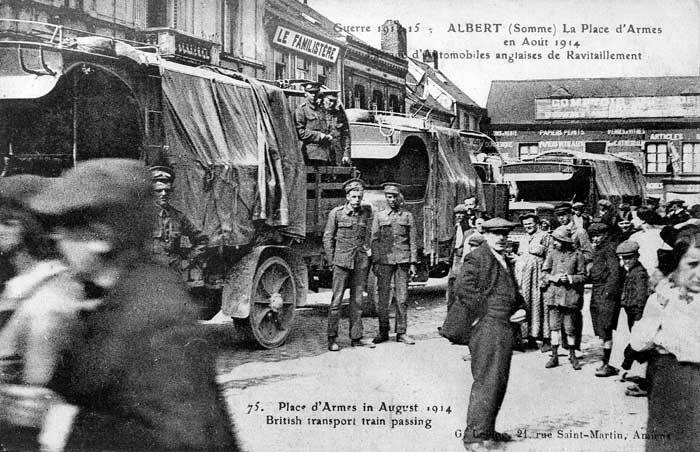 We couldn’t fail to notice we were on our way to France, surrounded by The Tricolour and parked on Rendezvous Street, there was a “street party” atmosphere and visitors revelled in climbing aboard such an unusual, emotive vehicle. 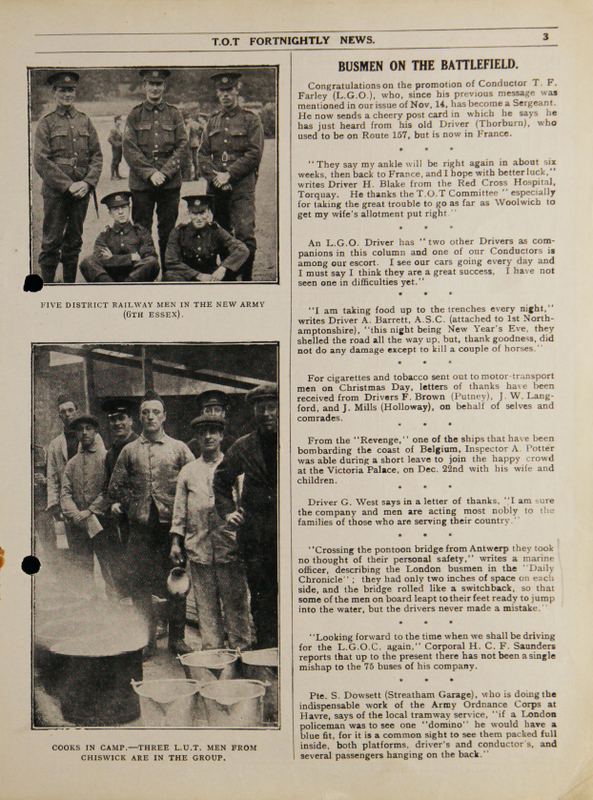 An ever-present contrast, here we met a man who recounted the bombing of a “potato queue” in the town during the First World War and the effect on his family. 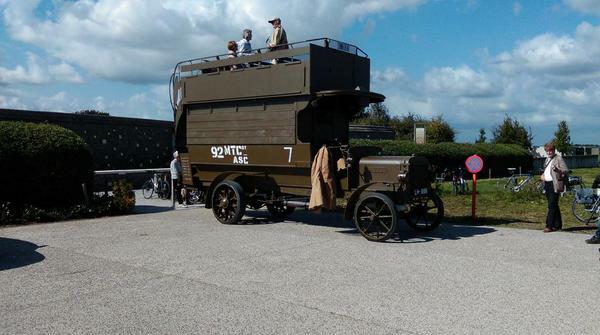 The next day we awoke in Belgium and travelled to Poperinge, where we were greeted by colleagues from a local museum and locals enthused by Battle Bus. 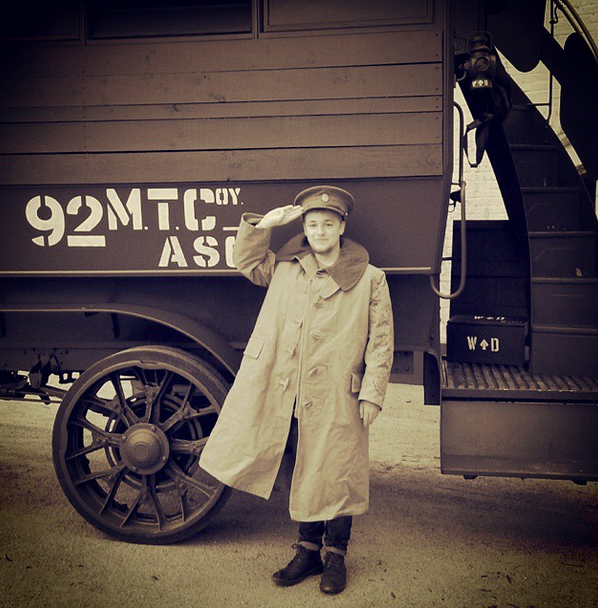 All were welcomed into our mobile exhibition telling the stories of the buses that went to war and the people whose lives were changed both at home and abroad. Many came with their stories, one that was especially exciting was a visitor who returned to show us his collection of French, Belgian and German papers from the First World War. It was truly fascinating to see all of the perspectives. I felt truly honoured to have played even a short role in such a historic journey. 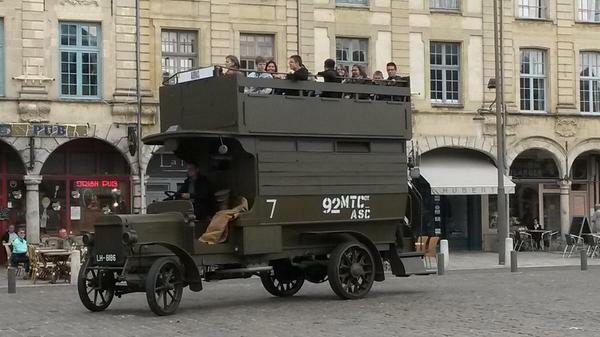 Our day at Poperinge was amazing, with visitors all excited to see the famous bus. I played the role of a conductress as we took locals, stakeholders and friends of the museum on a tour around the town. Later that day, there was a more sombre tone as we took Battle Bus to Bus House Cemetery to lay a wreath in a thoughtful ceremony. Along the way, the heavens opened up over our poor old bus, causing leaks through the roof in several different places. Everyone frantically saved the moquette seats from getting wet. Thankfully, the rain eased off and we stayed to pay our respects before heading back under some daunting and perhaps appropriate grey cloud over head. The next day we headed off to Ypres, it was a bright and busy Saturday so we were in for a good day. We attracted a great amount of visitors; I handed out at least 200 leaflets. I then took part in a tour around the cemeteries surrounding the area along with museum colleagues and a historian.This was a truly moving and surreal experience seeing the thousands upon thousands of soldier’s graves. We then prepared for the grand ceremony at the Menin Gate which was an overwhelming and emotional experience. The music played by the marching bands pulled on everyone’s heart strings, they were amazing to listen to. The best part of the night was when we drove the bus through the crowds to close the ceremony. A sea of people either side watched in awe and clapped joyfully as we drove past. I must say, I think we all felt pretty proud at that point and it was a perfect way to end the day. Overall, my time on the tour was extremely enjoyable and I was thrilled that I got the opportunity to be involved in such a wonderful project. 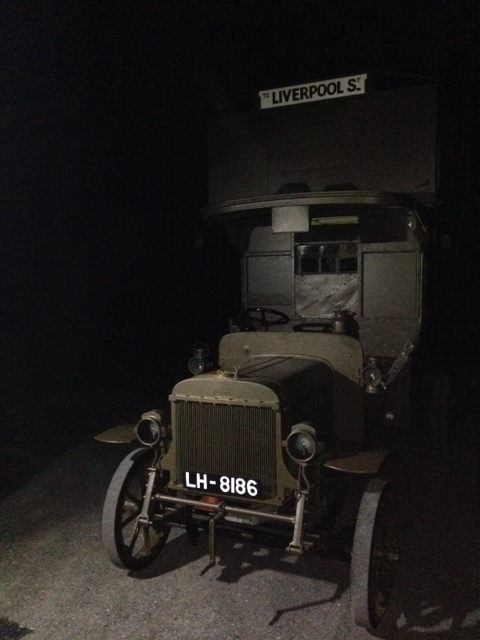 Our Battle Bus is proving to be a powerful flux for the emotions surrounding the centenary of the outbreak of the First World War. 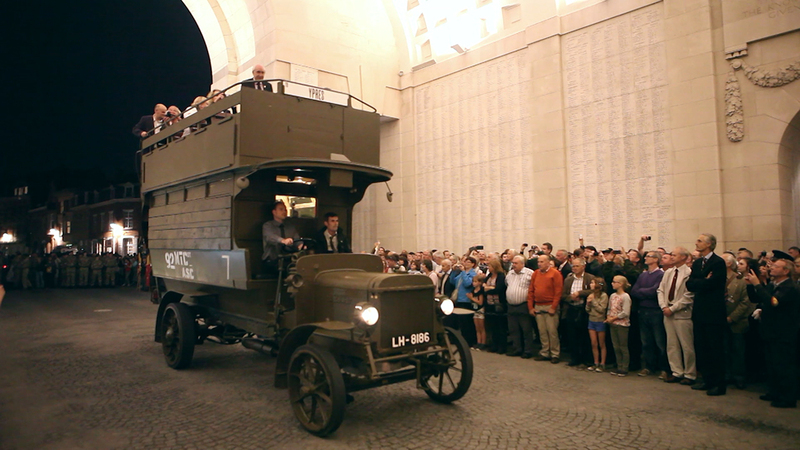 As we drove out of the Menin Gate after the moving Last Post ceremony, the crowds gave the bus a round of applause and wherever we have been we get cheers and waves and people keen to climb up to the top deck. The First World War exerts a uniquely strong emotional tug for us Britains. The carnage had a doleful impact on almost every family and every town and village in the country. Everyone can cite a personal connection with it but only in the cemeteries and scattered monuments can we make a physical connection with the terrible events of a century ago. Then this familiar object hoves into view, the distinctive shape of the B-type bus, a moving, clattering noisy survivor from the war, it’s usual red livery and shiny glass dulled and made a little forbidding by being boarded up and painted khaki green all over. Battle Bus makes that connection with a past that there is no one left to remember . Macdonald, Lynn (1983) Somme, pp.90-93, quoting Captain J Hoyles, MM, no.3237, 13th (S) Battalion, The Rifle Brigade, 5 July 1916. Joe Clough (1887-1976) was not only one of London’s first Black bus drivers, but he was also among the first drivers of the mechanised motorbuses that replaced the horse-drawn buses. 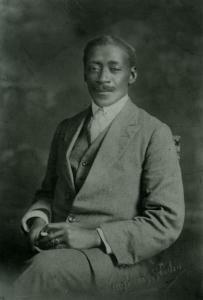 Born in Kingston, Jamaica in 1887, Clough worked for a Scottish doctor, Dr RC White. When Dr White came over to England, he brought Clough with him and after learning to drive as his employer’s chauffeur, he managed in 1910 to secure a job as a bus driver with LGOC. He drove the Route 11 between Liverpool Street and Wormwood Scrubs. In 1915, Clough joined the Army Service Corps at Kempston Barracks and drove an ambulance on the Western front in France until the end of the War. Clough was a popular member of the Army Service Corps and he was the captain of the cricket team. Yet as one of few black soldiers, he was sometimes the victim of racism. Demobbed in 1919, he became a member of the Royal Legion and joined the National Omnibus Company at Bedford, where he lived with his wife Margaret. 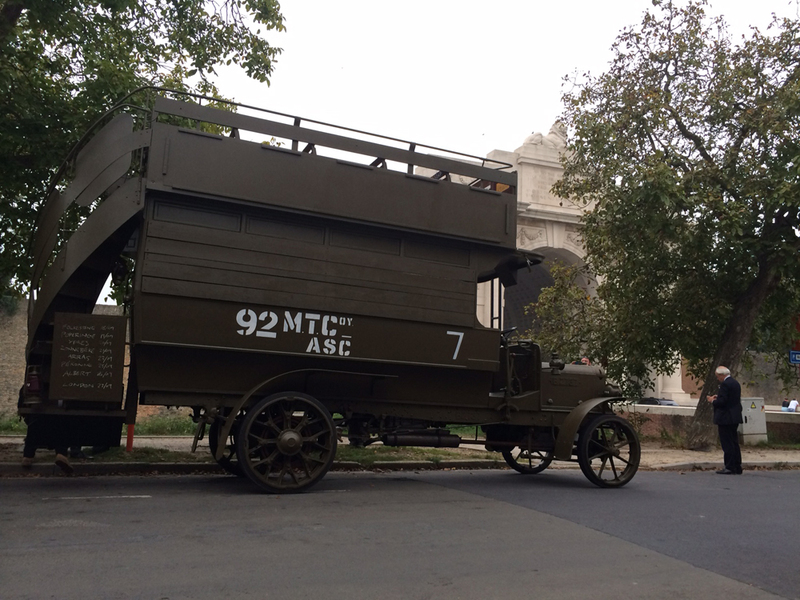 Between the world wars, Clough would drive an open-topped bus in Cambridgeshire every year on Remembrance Day. Joe Clough’s story can be seen in a video made by a group of young people from the Theatre Royal Stratford East that features in our Goodbye Piccadilly: From Home Front to Western Front exhibition, on until 8 March 2015. 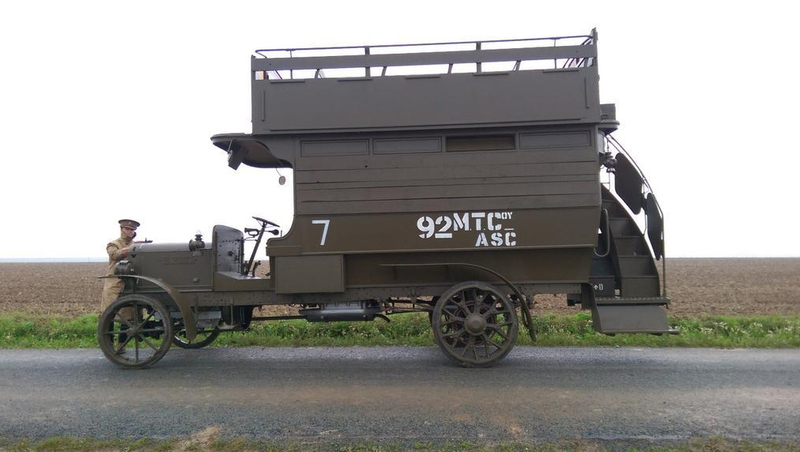 Today our restored B-type Battle Bus will be been in and around the French city of Arras, close to the Western Front. 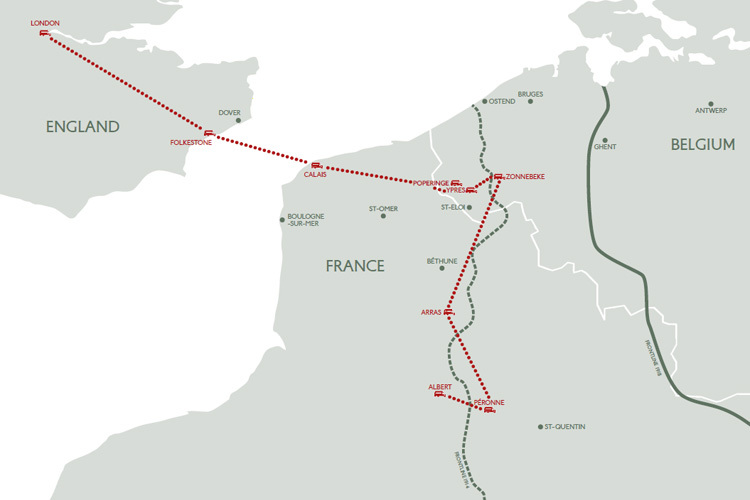 Allied forces took control of the Arras area in a series of offensives between April and May 1917 that have become known collectively as the Battle of Arras. 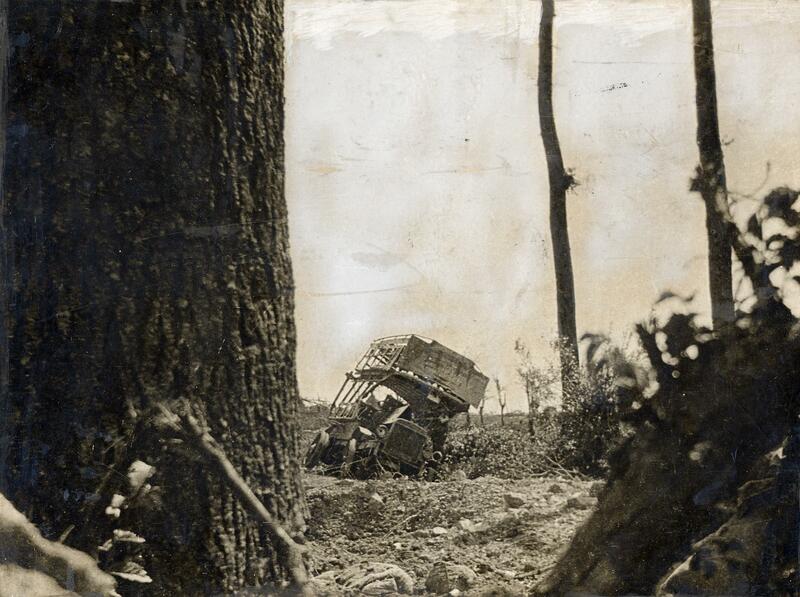 The intention was to break the stalemate of the Western Front, but despite heavy losses, this was unsuccessful. 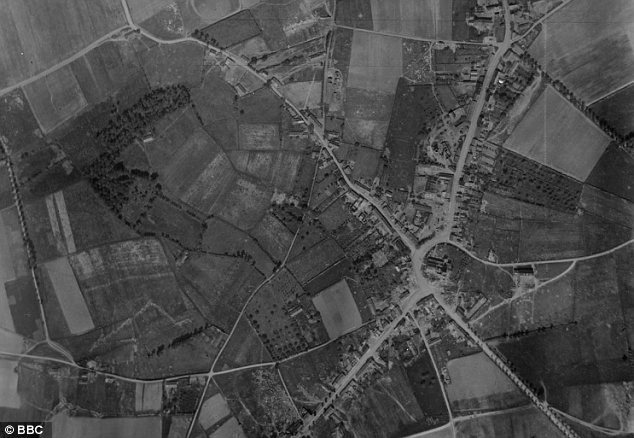 The village – an important strategic point – lay 10 miles to the east and benefited from a relatively high and commanding position. It was captured by Commonwealth forces on 11 April 1917. A cemetery was quickly established there and continued to be in use as a front-line cemetery until the German offensive of March 1918, when it fell into their hands. It was recaptured by the Canadian Corps on 26 August and used again for a month. The graves are very closely identified with the divisions which fought on this front and 581 troops from the UK and Canada are buried there. The tour moved on today to embrace the ridge which surrounds Ypres, and in particular the site of the third battle of Ypres, popularly known as Passchendaele (its contemporary spelling now ‘Passendale’). 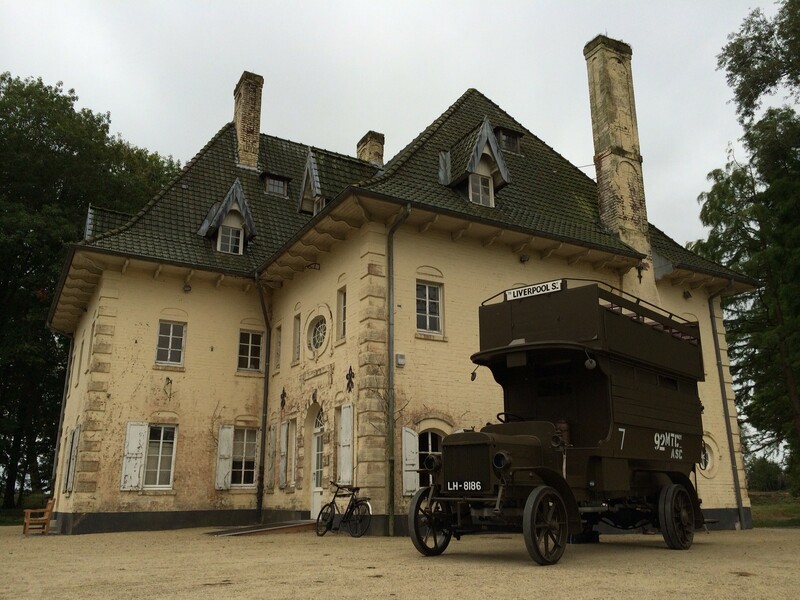 We brought the bus and our road show to the Passchendaele 1917 exhibition at Zonnebeke. It is hard to reconcile this peaceful park today with its total destruction by the end of the battle which lasted from July until October 1917. It’s exhibition and replica trench system give a flavour of why that name Passchendaele still holds such a powerful and dark meaning 97 years on. With the BBC’s wonderful Robert Hall aboard, we filmed and made interviews about the symbolic return of this one bus to a location in which so many once served. A visit to Tyne Cot, the largest cemetery in the Ypres Salient, reminded us sharply of the terrible cost of the slogging offensive uphill into the strong German positions on the ridge above Ypres. 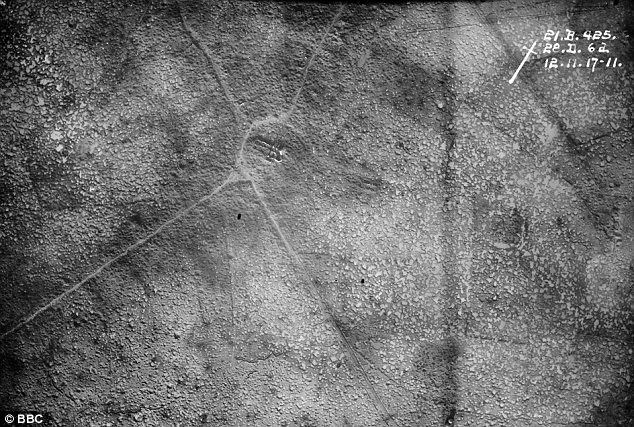 Aerial photographs in the visitor centre demonstrated graphically how the verdant Flanders countryside in 1917 was mashed up by four months of bombardment and counter bombardment into a landscape which from above looked like the moon, where whole villages had become piles of rubble and water-filled shell holes are the only recognisable feature in a blasted landscape. 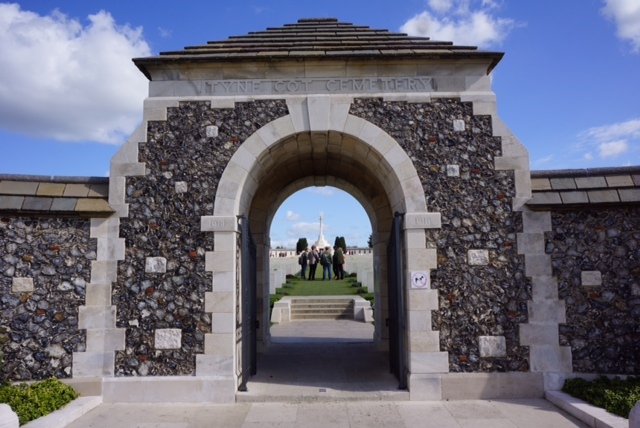 Long lines of gravestones in the Tyne Cot cemetery, so many individual names, all some grieving family’s son, so many regiments, representing so many personal tragedies in one small tract of Flanders. The bus was cheered from roadside cafés and attracted great interest when parked, so many people clambering up the narrow stairs and taking photographs. 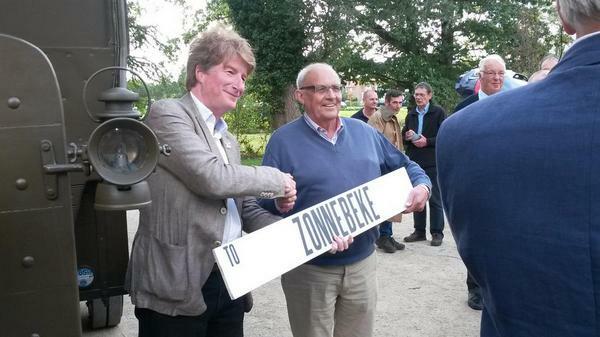 The Mayor of Zonnebeke visited and was presented with the destination board to his town by me. He and his family piled on the bus and were given a tour of the park. 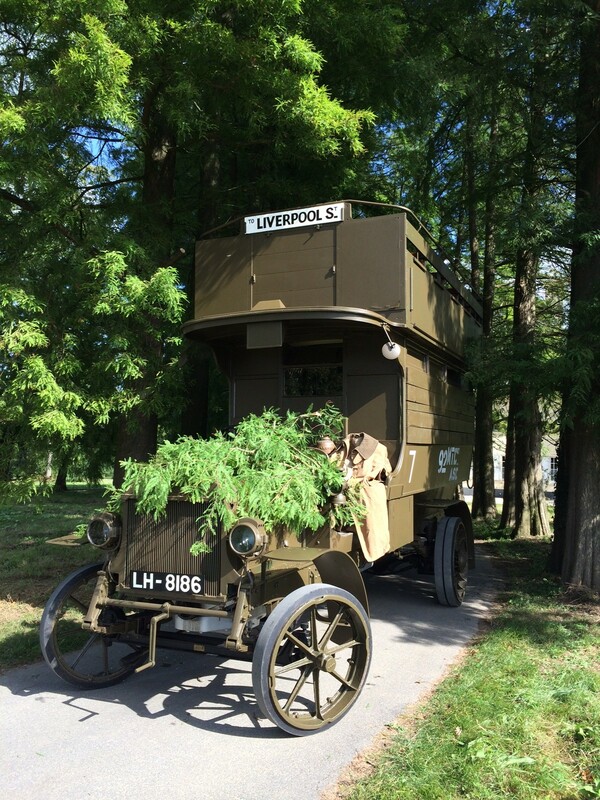 A French TV crew came to record the bus and hear the stories it attaches us to from a century ago, filming precariously from the back of an estate car as our bus rattled through the quiet Belgian Sunday afternoon.